WASHINGTON (CNN) -- If Sonia Sotomayor fulfills her long-held dream to sit on the Supreme Court, she would have the prestige of joining the highest court in the land, lifetime job security and a public forum as the first Hispanic on that bench. 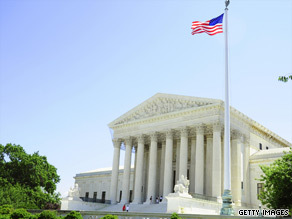 The Supreme Court is scheduled to dive back into its caseload a month early, on September 9. The 55-year-old judge would also have the opportunity to become a influential force among her colleagues, a legal pioneer who could help shape the law and its effect on society in any number of ways. But such a legacy would not come easily, and it certainly would not come quickly. The internal dynamics of a body built on tradition and stability have long discouraged swift and sweeping forces that are regularly felt in the other branches of government, and society at large. If confirmed by the Senate, Sotomayor would become the junior justice, someone with the least seniority but no less authority than her eight benchmates. She would bring with her a bit of history, along with the public attention and political scrutiny that would follow. "It's a step forward for the country. Having someone who's in a permanent lifetime appointment at the highest levels of the government who has this background, both economically and ethnically, is a big deal. It's a moment," said Thomas Goldstein, co-founder of scotusblog.com, who has argued before the justices as a private attorney. "The idea that a Democratic president did this and embraced them in this way will not be forgotten." After her swearing in, Sotomayor would quickly set up shop in her high court chambers. She would have a staff of aides and secretaries in place, as well as four law clerks to help her jump immediately into the caseload. The urgency may be especially acute for her. The high court has scheduled an oral argument for an important campaign finance reform case for September 9, in the middle of its traditional summer recess and almost a month before the justices normally begin their term. If Sotomayor is confirmed by senators in time, she may have to cram in order to hear the case with her colleagues -- no grace period or expanded learning curve. Justice Stephen Breyer has said it took him a few years on the high court before he felt truly comfortable in the job, and he had served as an appeals judge for 14 years before his elevation. It is a sentiment echoed by other justices: where the caseload, the pace of meeting deadlines and the sheer enormity of the issues facing the court can seem initially overwhelming. Her colleagues would warmly welcome their newest member, but she would soon find herself on her own. A myth of the court is that the justices operate as a unified bunch. The reality is that they are like nine little kingdoms, free to rule -- on the cases before them and in their own chambers -- as they see fit. Their work entails lots of reading, researching and writing -- most of it alone in front of a computer, maybe a writing pad, even typewriter. No wonder the seeming glamour of sitting on the Supreme Court often gives way to a sense of isolation and loneliness for new justices. "When you put on the black robe, the experience is sobering," the late Justice Lewis Powell once remarked. "It makes you more thoughtful." Powell said the biggest surprise when he joined the high court was how the justices communicated about the cases. Memos, mostly formal in tone and presentation, remain the norm. Phone calls from one justice to another are relatively rare, personal visits to chambers even more unusual. E-mails are not embraced, even in the digital age. But such interaction is key. After oral arguments, the court votes on a particular case, and a justice is assigned at conference to write an opinion, another to write a dissent. The goal is to craft a majority ruling that would command the support of all the colleagues on a particular side, since it would create a unified front and make it easier to establish lasting precedent guiding future courts. That's where personal relationships matter. Individual justices monitor what their colleagues are doing, collaborating to varying degrees on the language and scope of opinions, negotiating and engaging in a give-and-take. Sandra Day O'Connor in particular, before her retirement in 2006, was known inside the court for her backstage persuasiveness while building a national persona as the first female justice. "The justices learn about each other's views on the law and the Constitution, their strengths, their personalities," said Edward Lazarus, who wrote "Closed Chambers," an inside look at the court. "But that takes time. Justices Breyer and O'Connor became close colleagues on the bench because they discovered a similar approach to deciding cases, but that developed slowly over several years. Justices [Ruth Bader] Ginsburg and [Antonin] Scalia are very close personally -- they have similar intellectual and musical interests -- and you can't help but think that has helped bridge some disagreements in some cases, despite their deep differences on the law." Developing and nurturing that trust among differing personalities is not easy. Justice Oliver Wendell Holmes once described Supreme Court deliberations as "nine scorpions in a bottle," fiercely protective in carving out their own agendas and power bases. By all accounts, the current court as a group gets along very well personally. They like each other, and each can appreciate the diverse, often tough road each took to get to where they are. They all know how exclusive is the club to which they have gained entry, how random and unpredictable was their nomination. Yet this remains a profoundly divided court ideologically. A shaky conservative majority -- roughly four liberals and five conservatives, with Justice Anthony Kennedy often a swing vote -- has produced a simmering tension inside the marble walls of the court. As a presumed member of the progressive faction, Sotomayor could find herself on the losing end of many a fight over hot-button issues in the near future, relegating her to writing dissents. She would operate in the shadow of Justice John Paul Stevens, at 89, the oldest member of the court and the undisputed leader of his liberal colleagues. That authority is built on his nearly 40 years of seniority, his quiet skills as a tactician and his sharp writing prowess. Many liberal legal activists hope Sotomayor eventually follows the O'Connor model in crafting a power base inside and outside the court. As a group, the justices have wide experience. All served as federal appeals court judges, so they know well the intricacies of interpreting constitutional and legislative precedent. "They are well-prepared, active, informed, engaged, with tough questioning [of lawyers] from the bench," said David Garrow, a Pulitzer Prize-winning historian and high court expert. But the current court has by no means become a predictable group. One vote can tip the delicate ideological balance. Of the 79 full opinions issued last term, 23 were 5-4 votes, or about 29 percent. Most involved major issues such as workplace discrimination, broadcast indecency and DNA testing. Kennedy's views often proved decisive, and his influence remains undimmed. Sotomayor would quickly discover that the Supreme Court under Chief Justice John Roberts has not shied from taking on tough, timely cases. The fall 2009 docket includes appeals on religious displays on public land, Miranda rights, life sentences for underage criminals and international child abductions. This judicial confidence, Garrow said, gives "this court no second thoughts that it knows better than anyone else, especially the Congress, what is right." Sotomayor would leave behind her family and friends in her native New York. She is not married, and observers say her work as a judge consumes much of her life. Colleagues say she has managed to find time for herself and pursue interests off the bench, but she has admitted that has not been an easy balance to maintain. Lazarus, a former law clerk for Justice Harry Blackmun, remembered how his former boss "carved out for himself a distinctly solitary existence. From 8 to 9 every morning, Blackmun would breakfast with us clerks in the court cafeteria," he remembered. "But as 9 o'clock approached, the justice's attitude and demeanor changed radically. As he shifted into work mode, Blackmun became unapproachable, a man consumed by a mantle of professional duty that fairly seemed to crush him." Although Blackmun was known by his colleagues for a prickly personality, his sense of struggling to live up to the responsibilities of the job rings familiar. Sotomayor would bring a unique life experience -- personally and professionally -- to the job. She would come to it at a time of significant political and social change. The justice would have just one vote and one voice. Whether she would thrive in the long run at her future home would depend to a large extent on her intellect, work ethic and interpersonal skills. But forces outside her control -- namely the future ideological makeup of the court and the unforeseen hot-button issues that would confront her -- would ultimately shape the legacy she would leave.